Sounds more like a science-fiction novel than a wireless remote control for your TV, right? 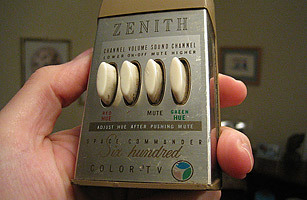 Developed by Robert Adler in 1956, the Space Command replaced the wired Lazy Bones controller that had been introduced by Zenith in 1950. Unlike today's battery-powered remotes, the Space Command was purely mechanical: pushing a button caused a tiny hammer inside the control to hit an aluminum rod that produced an ultrasonic sound. The TV interpreted the various clicks as commands to turn the TV on or off, mute the sound, turn the volume up or down or change the channel. There was enough noise from pressing each button that folks began calling the controller a "clicker."